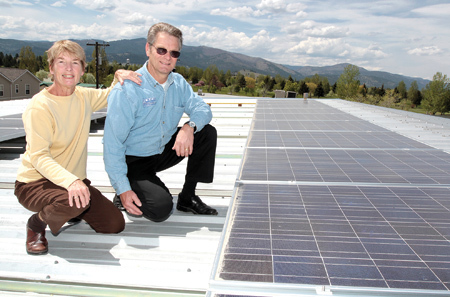 Roger and Sherry Petersen, owners of Palmer Electric Technology Energy Services, Inc. stand on the roof of their business next to solar panels supply energy to their building. P.E.T.E.S., Inc. has diversified to accommodate a more broad electrical service. “It’s hard to take a picture of a philosophy,” says Roger Petersen.